Figure. The asymptomatic eruption at presentation. 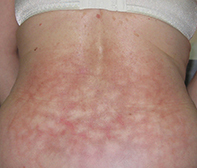 A 52-year-old woman presents with a reticulate, erythematous and pigmented eruption on her lower back (Figure). It is asymptomatic and was first noticed by her husband four months ago. The patient is generally well but suffers from osteoarthritis that affects her lower back. She regularly takes diclofenac and paracetamol for pain relief. Livedo reticularis is the term used to describe a vascular phenomenon of slow blood flow that causes a reticulate, erythematous cutaneous eruption that blanches on pressure. The most common distribution is on the lower legs and buttocks and it is usually bilaterally symmetrical. It can be associated with ulceration. Livedo reticularis may be either physiological or pathological. Physiological livedo is rapidly reversible on warming, whereas pathological livedo is not. Cold exposure is a physiological cause of livedo, leading to vasoconstriction that slows cutaneous blood flow and resulting in a bluish reticulate discolouration, particularly on the lower legs. Physiological livedo is not uncommon in newborn babies. • increased blood viscosity and hypercoagulable states (polycythaemia rubra vera, thrombocytosis, cryoglobulinaemia, gammopathies). Erythema ab igne is the correct diagnosis in this case. This is a skin reaction to repeated or prolonged exposure to heat that is insufficient to produce a direct burn. Transient reticular erythema occurs after a single exposure to heat, but after repeated exposure it becomes persistent and hyperpigmented, as burns often are. The rash is not only erythematous, but also hyperpigmented. It is localised to the area of skin that is in contact with the heat source, such as a hot water bottle (which this patient was applying), hot pack or radiator. When exposure to the heat insult is removed, the condition slowly resolves. In a patient who is otherwise well and has a definite history of heat exposure, the diagnosis of erythema ab igne is clear and the only condition that should be ruled out is thyroid disease. For the patient described above, the most important question to ask is whether she has been applying a hot water bottle to relieve her back pain. If so, no treatment other than cessation of the heat insult is required.